There is a significant amount of planning and work that goes on behind the scenes to turn trees into hardwood flooring. You can look at your gorgeous solid hardwood flooring every day. Have you ever wondered what happens before the floors are installed? There is a significant amount of planning and work that goes on behind the scenes to turn trees into hardwood flooring. Here is a brief overview of that process. Nowadays, the vast majority of lumber comes from carefully managed forests. 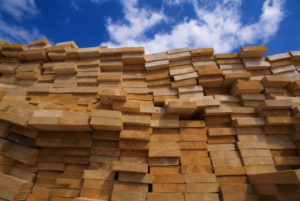 Different companies harvest lumber in different ways, but the four main methods are selection, group selection, shelter wood, or clear-cutting. Once the trees are cut, special equipment is used to retrieve the logs from the forest. It is then loaded onto transport trucks and taken to the sawmill to begin production. Once the logs arrive at the sawmill, they are de-barked. The machine grips either end of the log and spins it while a grinding tool removes the bark from all sides. Next, they move through a scanner that will select the best side for the first cut, whichever will be able to produce the most lumber, and then the whole log will be cut into long slices. These slices are then graded. The grade of the wood will determine its next step. Only certain, higher grades are used for hardwood flooring. Now that the lumber has been separated by grade and species, it is sent off to the flooring mill. Once there, the wood needs to be totally dried out. This can be via air drying or in a kiln that is kept between 100 and 108 degrees Fahrenheit. Once the pieces are dried and cooled, they are ready to send for cutting. As the planks are cut, graders sort the boards by grade and bundle them to be shipped off to distributors to be sold and installed in their new homes. Festool has all of the sanding tools and abrasives that you need, no matter the size of your project. From handheld sanding blocks to advanced planning tools, you can get all of your sanding tools and abrasives from Jason Brown Wood Floors. This entry was posted on Friday, February 8th, 2019 at 12:10 pm. Both comments and pings are currently closed.